It is our goal to be The Surface Repair Resource to the Refinisher and Repair Professional. As a key partner, industry manufacturers have come to rely on Multi-Tech's Product line and expertise since 1992. Whether you are a service technician, factory customer service representative or OEM quality control manager, you will find that navigating through our website will unveil a wealth of information that will expand your professional capacity by providing you with our expert-level knowledge and resources. At Multi-Tech, we provide you with our many years of field expertise, as well as, our hands-on application development direct from the factory floor. Our product line expands across an unlimited line of applications. We provide factory color matched repair materials used by virtually every manufacturer in the industry. We bring these specially engineered materials to the industry with an extensive factory and standard color offering. Through our unique relationships with the industry's leading OEM's, Multi-Tech Products has amassed an extensive, historical archive of bath ware and spa color textures. 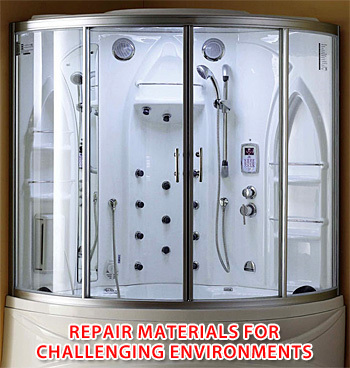 Although our primary business is bath and spa repair supplies, we bring to you advanced knowledge in the repair of cosmetic and structural composite materials. You will find that most of the materials used to fabricate and repair these surfaces and structures cross over into many other industries including Boats, Marine, Power Sports, Farm Implements, RV, Snowmobile, Automotive, Transportation, and Industrial Fabrications. We make a distinction between “wet area” and “dry area” repairs. We also take into consideration whether the product is indoors or outdoors. These special design considerations provide the basis for our claim to provide the best engineered, highest quality surface repair materials. "Excellence in Surface Repair Products!" We understand that “time is money” and that efficiency should not come at the cost of compromising the integrity of the materials, the final look or the longevity of the surface repaired—whether in the factory or the field. We provide factory color-matched, OEM repair materials used by major composite Bath Ware and Spa Manufacturers. We bring these superior materials to the trade with an extensive factory and standard color offering. Whether it is newly introduced colors or obsolete colors and textures, it is our commitment to continue to provide all of the materials required for repairing composite spa shells and bath ware fixtures to this ever changing industry. repair after the cost, longevity and warranty are reviewed? It is our intent to help you navigate through these questions. with information to make informed and cost-effective decisions. longevity within the application environment when practical. At Multi-Tech Products, our customers expect Quality, Performance and Longevity! and chemicals are part of the environment. Multi-Tech's Product line has been engineered to provide maximum performance in each of these areas. The end results are a happy customer, and no need to return to repeat a repair. It's all in the name! Multi-Tech, Multi-Talent, Multi-Technical. We hope that your experience with our company and our integrated approach to repair, promotes a philosophy of expansion and new opportunities within the diversified industry of spot repair, surface repair, refurbishing and refinishing.